Why Do Tennis Balls Have Numbers? Over the years, the numbers on tennis balls have caused much speculation about their intended purpose. The International Tennis Federation, the governing organization that sets regulations for balls and other equipment, gives detailed specifications for the manufacture of tennis balls, but putting numbers on the balls is not one of those specifications. The ITF mandates three types of balls to allow for play on different types of court surfaces. The organization uses numbers to identify the different types. Type 1 is for play on slow court surfaces, such as clay. Type 2 is for medium-paced courts, such acrylic and carpet, and Type 3 is for faster courts, such as artificial turf and grass. Contrary to what some people believe, the numbers on tennis balls do not indicate a type of ball. There are only three numbered types of balls, and numbers greater than three appear on various balls. The reason for numbers on tennis balls turns out to be a very simple one, according to Whitney Kraft, director of tennis at the United States Tennis Association's Billie Jean King National Tennis Center. If you've ever played tennis on a court adjacent to other courts, you know how easily your ball can go astray and end up on one of the other courts. The numbers on the balls, according to Kraft, are to help players identify their balls when this happens. A package of tennis balls typically contains three balls. All balls in a package have the same number on them, along with the name of the manufacturing company. It is common practice for players to take note of the brand and number on the balls before they begin play so they can easily identify them if they accidentally end up on another court, mixed with other balls. 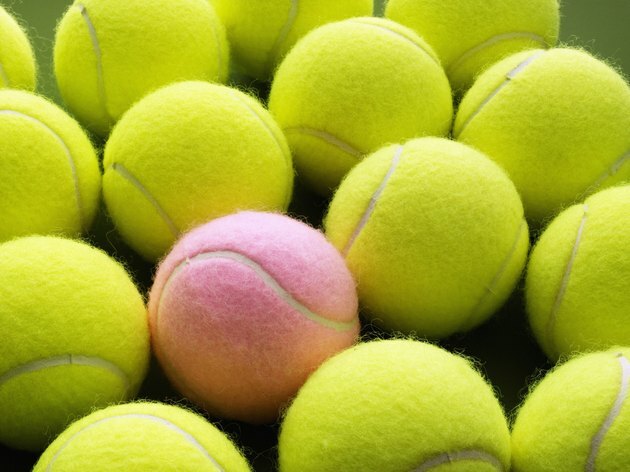 Novice players may not realize the importance of being able to identify your tennis balls. Most manufacturers package balls in a pressurized can or tube to prolong their shelf life. However, once you open a package, the balls start to lose their bounce. The longer a ball is used, the less effective it becomes. Many veteran players use a new package of balls every time they play. If you’re playing with new balls and the players on the adjacent court are using older, less effective balls, you want to be able to retrieve your own ball instead of an old, tattered one should they become mingled.